Sharing the longevity of chefs, Chef Mair has participated in the Men Who Cook for 20+ years. Hans was trained as a professional chef in Europe and has traveled around the world as a chef on the SS Rotterdam / Holland America Lines and worked in the Bahamas and Montreal. He is a father of 3 children and is married to Darby. His love of cooking comes through every time he makes his Hanzee’s Crab Cakes. Barry has been married to Melissa for 29 years. Both are from the Golden Triangle in Southeast Texas but got to the Kemah/Seabrook area as fast as possible (1986). They have three children….all gone. Needless to say they are happy empty nesters. They are proud owners of T-Bone Tom's in Kemah since 1999, Tookies Hamburgers since 2010 and Tookies Seafood. 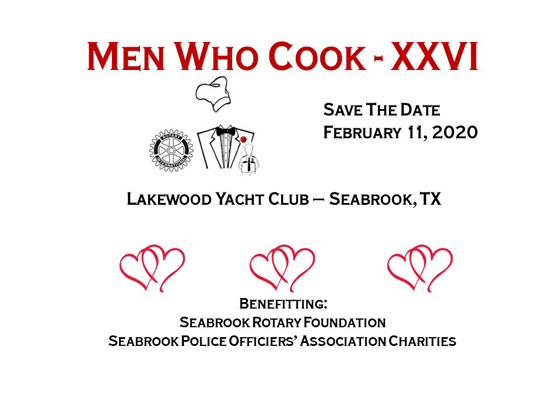 Seabrook Rotary’s “Men Who Cook” will be cooking and serving at the Lakewood Yacht Club. 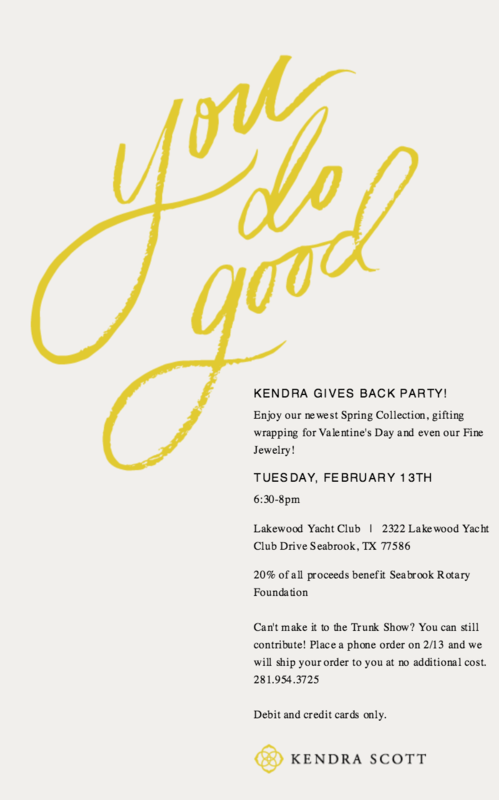 All proceeds will benefit the Seabrook Rotary Foundation and the Seabrook Police Officers Association Charities. Don’t forget your dancing shoes. Not only will the event include a wonderful variety of food prepared by Bay Area Celebrity Chefs, this year, the Men Who Cook event will feature the musical talents of Velvet Punch! Click here to learn more about them! Have you always wanted to participate in a great event, meet new friends and show off your cooking skills? The Seabrook Men Who Cook is looking for you. Every year we have dozens of local Celebrity Chefs who don the Chefs apron for our charity event. If you are interested in becoming a Chef, visit our Becoming a Chef page. So come on out and support the Seabrook’s Rotary Men Who Cook. It’s sure to be an unforgettable evening. The Bermuda-style clubhouse provides Lakewood’s 500 plus members with quiet harbor-view dining facilities and excellent cuisine provided by a professionally trained executive chef. Lakewood has a newly remodeled bar and piano lounge with several large screen televisions and a beautiful ballroom for monthly holiday/event parties as well as popular Sunday brunches. A Game Room provides supervised activities for members’ children. There is something for everyone at Lakewood beginning with a strong agenda of regattas and cruises organized annually by Lakewood's enthusiastic volunteers. An active Ladies Association has a busy monthly agenda, which includes a special summer activity. The Youth Program, known as the Seahorses, is guided year-round by the club's parent volunteers and Lakewood’s full-time Sailing Director. Three lighted tennis courts and friendly but competitive monthly tennis socials and weekly matches add to the allure of Lakewood. We invite you to make Lakewood Yacht Club your home away from home, your own personal yachting haven. We are a local community newspaper in Texas covering the cities of Seabrook, Kemah and surroundings areas. We deliver information on local community news, events, education, entertainment and much more. Our mission is to publish a quality independent community newspaper that adds to the identity and pride of the communities we serve, record and report the history of the Bay Area and its people, and to enhance the quality of life for local citizens and merchants. The Bay Area Observer is dedicated to the belief that a strong community newspaper is essential to a strong community. We encourage and welcome local citizens to submit community news and events, engagement and wedding announcements, birth announcements, or any news you would like us to report to the local community. Please contact us with your news. 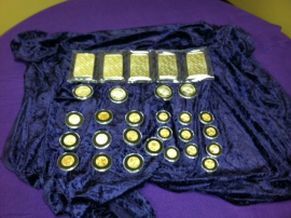 Our most exciting new addition to Men Who Cook is a raffle for $10,000.00 in pure gold coinage! This giveaway will take place in the form of a fun and unusual Reverse Draw. There will be a number of other prizes awarded to ticket holders throughout the evening, most valued at or greater than the amount of the raffle ticket. After a winner is selected, all losing tickets will be shuffled again and a consolation ticket will be drawn for $1,000.00 in pure silver coinage. Only 300 raffle tickets are available at $100.00 each. Not only are those awesome odds, but the raffle tickets would make for novel stocking stuffers. Raffle tickets are available for purchase only through Seabrook Rotary Members.